Tux – yes, that is Tux the Linux Penguin for you geeks out there – has starting competing internationally at sliding down the mountain on his belly. This might not sound like a good idea for a game but this really is a great game. 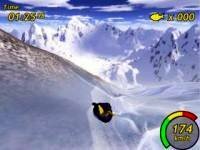 Everything about this game is smooth, from the slippery icy slopes to the game play. 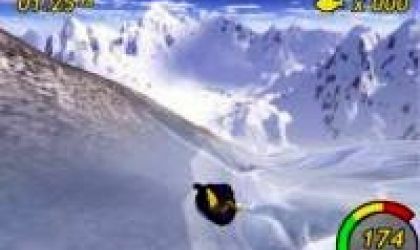 The quality is top class with great 3D graphics, nice textures, funky music, the whole shebang. The only reason I did not award one hundred percent was because the game could have included a little more depth to take advantage of the wonderful game play. However, I thoroughly recommend this game, and I think anyone will enjoy it to some extent. 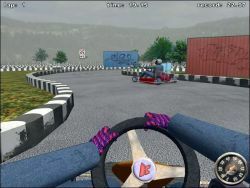 From the time we first downloaded and played this game and till today, we still enjoy Tux Racer! The graphics and 3-D like scenery really took our breath away and we couldn't stop laughing at all the different spins and flips the penguin does (especially in "Who Says That Penguins Couldn't Fly" track). We, the kids and I say that this game is a definite download! 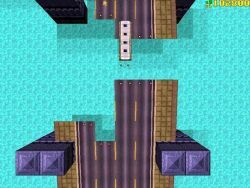 I had this brilliant game on my old pc for years and now that I have replaced that one with my new one, I still want Tux Racer. We all play this one & some of us are nearly Silver Surfers. We get more fun on the practice runs than in the race. I play this at school. you know how at the end of who said penguins can't fly? the valley is very far from the finish line. It looked like a good idea but it let me down and I am very disappointed! You do cool races and it's quite challenging.